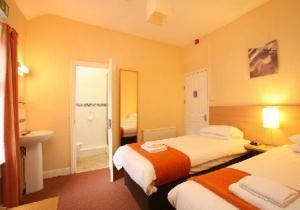 We offer a mixture of comfortable Single, Twin, Double and Triple rooms, all en suite. All our rooms are equipped with LCD televisions with 'Freeview', alarm clock and tea & coffee making facilities. There is a television lounge with free WiFi and guests are welcome to use our private car park. Our bedrooms are clean and comfortable with good quality duvets and pillows. You will find our staff to be friendly, helpful and keen to make your stay as enjoyable as possible. M4 Jct 29, follow directions for Docks (A4161). Direct to Newport Road. First hotel on the left handside as you approach Cardiff. Situated on Newport Road. One mile from Cardiff Queen Street Railway Station, there is also a bus stop just outside the hotel that will take you directly to and from the Central Bus and Train station.